Cornubia, Devonia, Somersetus, Dorcestria, Wiltonia, Glocestria Monumetha, Glamorgan, Caermarden, Penbrok, Cardigan, Radnor, Breknoke, Herefordia, & Wigornia - Mercator, G.
Title : Cornubia, Devonia, Somersetus, Dorcestria, Wiltonia, Glocestria Monumetha, Glamorgan, Caermarden, Penbrok, Cardigan, Radnor, Breknoke, Herefordia, & Wigornia. Size : 14.6 x 18.5 inches. / 37.0 x 47.0 cm. 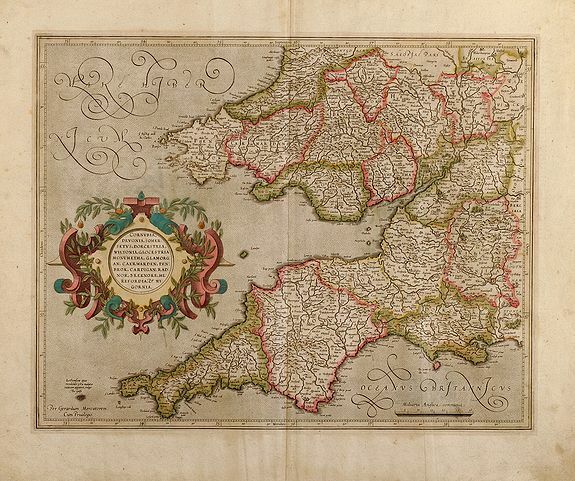 Description :Original coloured map of south west England and south Wales of Gerard Mercator. From a Latin edition of the Mercator Hondius Atlases. Condition : Slightly browned from former framing, some foxing, flatted vertical creases. Good and strong impression in original colours.